As much as I love Malaysian food, I must confess that until recently, the humble roti canai had never really appealed to me. After all, as a man of Bangladeshi origin, I’m pretty familiar with round rotis and round parathas, and the even rounder individuals who can make them disappear. For me, there wasn’t much that the roti canai could offer, and when faced with a long list of Malaysian food, I almost always overlooked it. However, there is one Malaysian restaurant in London where this simple staple simply cannot be ignored. Euston’s Roti King is the aptly-named royalty of roti canai, and the winding queue that forms along its descending steps often speaks for itself. Putting my prejudices aside, I joined Steak, My Big Fat Halal Blog, and Halal Gems to see what all the excitement was about. Halal status: All the food served here is halal. Amongst our order were two plates of roti canai – one served with dhaal, and another with lamb curry. Instantly, I came to realise that my expectations of roti canai – and indeed my prior experiences of it, were far removed from the plates before me. Rather than being overly crispy or flat or firm, the rotis were soft, airy, and incredibly light. To a certain extent, one could even describe them as pillowy – if the pillow in question had been flattened by a small hippopotamus. The layers could be pulled apart with nothing more than a finger and a thumb, and the crisp coat and the thick, buttery core instantly lapped up the rich dhaal, which won a unanimous vote of approval over the dull lamb curry. Texturally, the nasi lemak also surprised us, as the perfectly crispy chicken remained incredibly light and tender, and could be broken away with little – (if any), effort. In combination with the slurry of sambal sauce, it delivered a subtle, spiced flavour right until the very end. The mee goreng mamak served as our final main course of the afternoon, and here we encountered a combination of stir-fried egg noodles, chicken, prawn, and tofu. The soft noodles were saturated with a rich, savoury flavour, and the combination proved to be more than satiating. Given the versatility of roti, it was no surprise to see it on the dessert menu too, and we soon found ourselves faced with a selection of sweet roti pisang (roti with bananas), roti kaya (roti with coconut jam), and roti planta (roti with condensed milk and butter). Whilst I preferred the roti laced with bananas – (on account of me being a human gorilla), the others preferred the combination of condensed milk and butter. This left the coconut jam, which, aside from having little to no trace of coconut at all, was far too rich and overpowering – even for the likes of me. If there’s one thing that you can expect at the end of a meal at Roti King, it’s that your wallet will almost certainly be as full as your stomach. Portions are generous and dishes range from £3 to £7, making it incredibly difficult to rack up a significant bill. Our own meal amounted to no more than £11 each, which prompted me to question whether we had indeed eaten enough. Steak proceeded to point to my stomach, and politely reminded me that I had “eaten enough” a long time ago. The calibre of service however, is far less impressive – if not completely impersonal. As we polished off our desserts and our tea, we were pretty much asked to pack up and leave – on account of the long queue of customers outside. Given that we were literally getting ready to leave anyway, it was a rather poorly-timed display of discourtesy, and a grand finale to a meal where we were not given any real ounce of warmth or welcome. This apathy continues in Roti King’s underground decor, which is unapologetic, but strangely, rather endearing at the same time. The space can be described as “cosy” or “cramped” depending upon your perspective, and the rustic set-up amplifies a sense of “eat your food and get out” – which is very much the ethos of small street-based eateries in East Asia. This certainly adds a sense of authenticity, and you should be prepared to rub shoulders with your dining companions and return home with a broken back. Roti King can be found a short walk away from Kings Cross and Euston Square underground stations, and we would advise that you get there early – (at 12pm or 5pm) to avoid standing around in the queue. 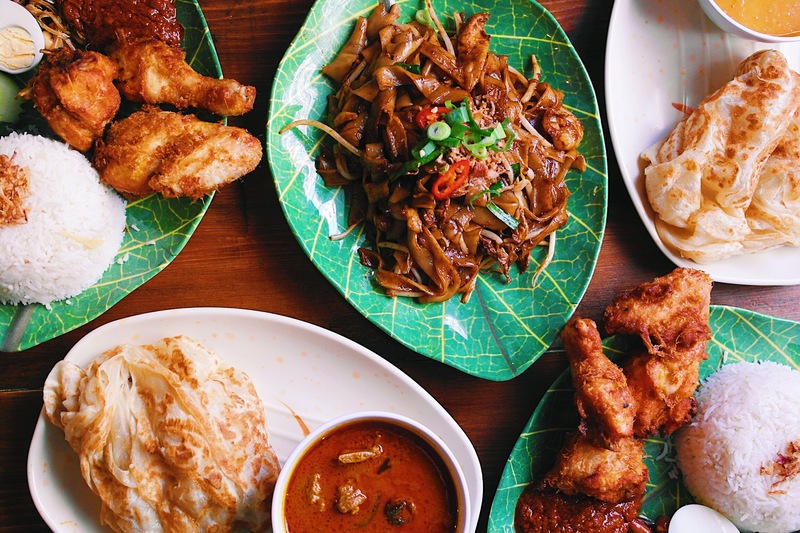 Putting aside the rushed service and the lack of sufficient breathing space, Roti King offers a modest Malaysian dining experience that is every bit as enjoyable as it is affordable. The roti canai alone transformed my very perception of the humble flatbread, and whilst there is certainly an element of overinflated “cult status”, Roti King, does, for the most part, deserve the attention that it gets.